You probably have someone that’s so addicted to their phone they can’t put it down during dinner. If that person has a birthday coming up we know the perfect thing to get them. 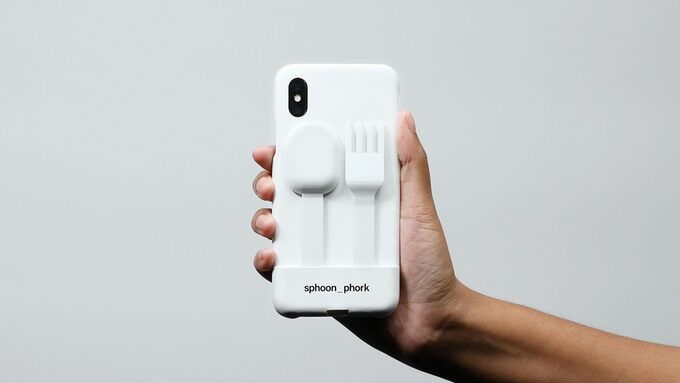 The spoon_phork is a spoon and fork set you can plug in a special phone cover. You’ll never have to put down your phone while eating, it’s perfect! You know someone was thinking about a further integration of the phone into our lives for the Instafoodies. Even if you’re not that crazy thinking of using your phone to spear your food, this is still a neat invention for when you want to battle plastic waste. You’ll always have a set of reusable eating utensils with you! Where can I get this spoon and fork for my smartphone? The sphoon_phork is compatible with the iPhone 7, 8, X and XS. More phones will be supported the more people back this project. Visit the official Kickstarter page.